Dark forces have gathered and the final battle for Illustra has begun. Book 3 of The Staff and The Sword series. My previous trips into the fantasy world of Patrick Carr were a mixed bag (see my reviews here and here). But the essential chestnut at the heart of the story intrigued me enough to give the third and last volume of the series a go, and I’m quite happy I did. A Draw of Kings is everything I’d hoped the previous books would be, bringing the story to a dramatic and satisfying conclusion. There are still rough patches, but this time around they’re well worth the journey. I was surprised but pleased that the heroes’ first obstacle was dispatched within the first third of the novel, rather than dragging out a story that held so little consequence for the final climax. The story than split into three quests. It’s a testament to author Patrick Carr’s growing skill that I was able to follow each story without much trouble, even after so much time had passed reading the previous books. Just enough hints were dropped to jog my memory of previous characters and encounters without distracting from the narrative. This novel finally shines the most light on the more interesting facets of this world, it’s political and theological concerns, and actually took the dangers faced by the kingdom seriously, lending a more mature tone to our characters that suited them. Errol behaved like the seasoned warrior he’s become. Princess Adora’s viewpoint was given more time in this book, not always to her credit: she’s always felt a bit shallow, with a tendency to fly off the handle at odds with her characterization as a seasoned veteran of court. However, her pairing with Rothka made for a good contrasting blend in their various adventures; sadly, such lengthy accounts of two women working together in fantasy are rare. By far my favorite characters, the trio Martin, Luis, and Cruk, coupled with their new fellow traveler Karele, faced a new set of challenges that allowed them to finally face their own shortcomings. In particular there’s a strong sense of loss that can not be repaid, in this world at least. Liam remains the least developed main character, and yet I gained appreciation for him this time around for that very reason: it’s another rarity to read of a hero allowed to be just that, without explanation or apology. Alas, it’s not all great storytelling. There’s still a tendency for the narrative to halt for excessive description of minor characters. Though Carr juggled many competing storylines with competent ability, there’s a bit much here for one book, given it a crammed feeling. Some story threads never fully resolved, and there were moments aplenty where I felt the story rush forward past minor plot problems in an attempt to get everything covered. Also, there was a strange reoccurring theme of physical violence used by our heroes against those in a weaker position that I found troubling: all seemed to fall into this trap, despite their personalities, with no comment whatsoever on its morality. That being said, I read this book for one reason: to finally learn who the chosen king of Illustra was. This essential question haunted (with varying degrees of success) the previous books, and it continues to plague all as the final battles of the war rage about the kingdom. There’s a real sense of loss here, of everything crashing down despite everyone’s best efforts, and I applaud Carr for actually allowing characters to die and face dire consequences rather than rescue everyone. Like all great mysteries this one was deceptively simple, hiding the answer in plain sight. I’d encourage him to tackle a whodunit in his next project: this aspect of the series, with its theopolitical underpinnings, provided the best moments by far. 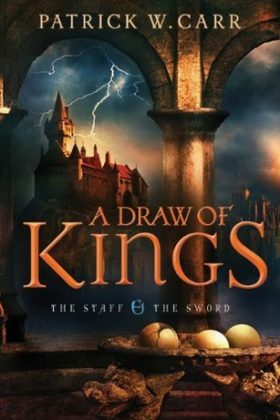 It could certainly be better, but A Draw of Kings is the series’ strongest offering by far. This conclusion offers something for fans and casual readers alike, even skeptical ones like myself. It makes the other two books better, which is the best possible praise a third act can offer. Good news for all: this series is one that only improves as it develops.